I am disappointed that the hadith regarding the best place for a woman to pray hasn’t been mentioned. The best place for a woman to pray is the quietest and most secret place in her house, there is a hadith which mentions this. True, but the two matters are not contractory. He (sws) also said, do not prevent the women from attending the Masjid. In the West in particular, Masjids are often the center of community life. There are sisters’ groups and classes for women. The women therefore deserve a good space. They should be treated with respect. I don’t want to argue, but I have to do it I feel. While there are numerous fair and good articles on this site, this is clearly a biased one. I don’t like the fact that the author is comparing women contributing money ie $25k inside a few mins and men not contributing that much. This is completely unfair, men have to do the breadwinning for their families, these women have the luxury of giving away that kind of money, men don’t because they have families to think of first. I wish people didn’t compare men and women because whilst they are equal in many ways, they are also very different and in Islam have very different roles. Most masjids do try to accomodate women, but not before they accomodate the men. The best place for men to pray is the masjid is in congreation at the Masjid, the best place for a woman is the most secret place in her house, usually her bedroom. I agree , Mohammed . I totally agree with Brother Wael. In most cases the only time women get any Islamic education is when they go to the masjid. Most men are not taking any time to sit and teach their families about Islam. We use the excuse that we are busy with our jobs, but the reality is that many of us are just chasing dunya. If our wives are the first teachers of our children then it is even more important that they attend the masjid with the proper space to learn. If the husband is not teaching her, then it is a must that they go as a family to the masjid and learn together. We are treating the masjid as if it is a men’s club and that women are not allowed. If our brother’s were doing their jobs as husbands, and have established a wholesome Muslim household then there may be an argument but as Wael said, the masjid serves as a center of community life, and education. Let’s make those spaces comfortable for our mother’s, sister’s, aunts and daughter’s to come and learn. Our women are the teacher’s of the future generations. If they are unable to pass along the teaching’s of the qur’an and sunnah then who will? I was going to comment the same as Muhammad. When there is a sahih hadith that says that the best place for the man to pray is the front row of the salah in the masjid and for women there is more reward praying at home- what woman in her right mind would want to get less reward by praying in the masjid. However, if a woman is traveling it would obviously be appropriate for her to pray in the masjid as opposed to in the car or on the street, etc. Allah knows best. It is certainly a necessary part of gender reform to have both women and men advocate on behalf of equal access to the mosque. I want to commend the brother. I think he might have gone a tad bit too far by outlining the full agenda for a Women’s Caucus, as if we are NOT competent to do that on our own should such an initiative prove possible! Why does it bother you that the author suggests that women have ample space in the masjid? I’ve read that hadith as well, but could you shed some light on this matter, from your perspective? 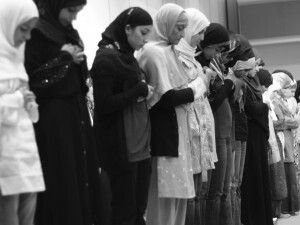 Why do you think it is important for a woman to pray at home versus in a masjid? Whilst there is no harm and no reason for women not to pray in the Masjid, I have stated that according to many scholars, the best place for any woman to pray is the home. It is the reason why every single woman I know does not go to the Masjid to pray. They say that going to the masjid is a good place to socialise and meet other Muslims etc, but is it really? Ever since I was a boy, I was told the Masjid was a place for worship and learning Islam, not for socialising or meeting new people as such. If you want to go to Masjid to pray you do that, but please bear in mind that many Scholars believe it’s best for you to pray at home. There’s an important point that you are missing. In the Muslim world, a Muslim woman may experience fellowship with other Muslims anywhere. She can make friends at work or at school. She can acquire Islamic knowledge from TV programs, and even from courses offered at school or the university. For a Muslimah in the West, it’s not like that. For a convert Muslimah, for example, her best chance to acquire Islamic knowledge and get her questions answered is at Masjid classes, hopefully a Masjid that is open and friendly to women. Of course she can read books, but that’s not enough. Most converts need some personal guidance and direction in their studies, and the best place for them to get that is at a Masjid that has a sisterhood group, classes for women, and lectures that are open to men and women. When the Messenger of Allah (sws) used to teach, men and women would be present in the Masjid, and women would sometimes ask questions. He set the example for us. The women were welcome in his Masjid. They were not shunted off to some tiny room. Why do we think we know better than him? We should follow his example. I have been in Masjids where women prayed in the same large hall as men, and attended community meetings. In one case there were female members on the Shura Council. What I noticed in these communities is that a lot more got done. These communities had more programs going on, and were better organized. The children were more involved as well. Why? Because women are half of the community. When you involve them in Masjid affairs, you have twice as many minds and hands contributing. I think one of the many reasons why the Muslim world is in such bad shape is because we treat our women like baby making and cooking machines and nothing more. We ignore their intellects and spirits. This affects our children, since the women generally spend more time with the children than anyone else. We get a new generation who are Islamically uneducated and spiritually vacant. So do you think women should not go to masjid to learn the deen? Perhaps most scholars think that Islam was created for men only and women have no Islamic responsibilities. If you think a woman should learn in masjid, then should she go back home to pray, or is it okay to pray there? Maybe the hadith is considering famial obligations but there are also hadiths about the prophet S.A.W shortening the prayer or letting the women leave first. He would have forbidden it if he deemed it proper. Ideally Wael you paint a perfect picture, in reality it’s not as simple, it really isn’t. The vast majority of masjid in the UK are small masjid built in normal residential properties, in fact if there weren’t signs outside with the Masjid name, you’d think it was someone’s home. In these Masjid, there’s barely enough room for the full congregation of men, many times when I attend for Jummah prayers, we have to go in 30-45 mins early to get a place inside the masjid, they say many men pray outside on the pavement/footpath. How is it possible to accommodate women without having to sacrifice space for men? Thankfully, many masjids have not forgotten the women, so they have built speaker systems which can be connected to people’s home and women/elderly can pray from home. Wael summed it up perfectly! I hadn’t seen his post. Great article!!!! Without any doubt, the place that is reserved to women in the masjid is a reflection of the respect that masjid leaders have for women. Subhana Allah! To us, people who live in the West, going to the masjid feels like going to haj, pilgrimage. Praying at the masjid gives us the opportunity to learn about our deen. Some people, may think women just need to stay and pray at home for reasons that are beyond my understanding but I would point to them that those who think that way are not depriving only women but also the children. How can I put this nicely without hurting anyone’s feeling: some muslim husbands do not go to the masjid; therefore, if the wives do not go to the masjid, the kids will not go to the masjid and they will grow and be ignorant of their religion. I am a muslimah and I cannot describe to you my happiness when I go to the masjid, alone or with my kids. I feel peace in my heart knowing I am close to Allah. Subhana Allah! Assalam alaikum ofcourse wall should be provided between male and female in order to prevent enteraction between them,& also remember ALMAR ATU KULLUHA AURATIN ILLA WAJHA HA WALKAFFAIN.& when man & woman get aside the third one of them is evil.Allahu aalam. Great article! Well written and precise. North America has large spaces to accommodate female prayers, and its time to stop segregation between male and female to learn Islam, ask questions regarding our deen, and to use the protocol of the religion, such as the respect of the masgid (المسجد) and to read the du’aa of entering and exiting the Masgid (المسجد) then there is no Evil (الشيطان), to enter between men and women because the main reason is to listen the Khutba, pray, learn or ask questions. I also agree most men push their children to live with their wife, sisters, etc. Men have a beautiful place to pray, spacious, nice ventilation system, quiet, and respectful. If we “Women” follow the rules of the masgid المسجد, then we can conquer of the segregation. I know lots of المسجد have open spaces for women to pray behind the men. Lastly, we might not need to pray behind men and that we can have our own community or المسجد to pray and sometimes invite men to give khutba to the women but could that be possible like some countries in Turkey or Pakistan, and much more who are doing great things. Oooh, I just love the proponents of what I refer to as Hislam; perhaps they need to read ‘Uthman dan Fodio? Now, as for the curtain that did not exist in the Prophet’s Masjid nor at Mecca during Hajj – just when did this become a requirement? How could something unknown to the Nabi (SAAW) suddenly become a fard? And why does the Maliki fiqh I learned require that I actually be able to see and follow the Imam if I am supposed to be securely hidden behind a curtain? Especially since in Maliki fiqh a woman cannot lead even a group of other women in prayer? So, if women weren’t to attend the masjid, wouldn’t this be a rather silly injunction? Especially since if one is praying at home with family, the family tends to all pray together. After having to walk through dumpsters and spilled garbage to the women’s entrance, and having to pray on the floor of a school room downstairs from the Imam and follow on a loudspeaker, or praying in a space piled with junked furniture and trash, and being left with an entire group of sisters face down when the Imam didn’t speak loudly enough for us to realize that the salaat was over, and after having been told how disgusting it was for women to pray in the masjid by an Imam who apparently made his intention as Imam to lead only men – well, quite frankly, it’s surprising any women still pray at all. Especially when we listen to men tell us how the clear text isn’t really clear, and how the rightly guided caliphs, and how the Imams of the four schools of fiqh were also apparently, and horribly, wrong in assuming that women were allowed to attend the masjid because the Nabi (SAAW) said so. As for children running wild in the women’s section, it isn’t just men abandoning children to their wives. Men who come to the masjid with their children, and without their wives, think nothing of shoving the kids into the women’s section and fully expect any woman present to watch them. In fact, on one occasion I stopped to do salaat on my way back from a college class and watched as a Muslim man opened the door to the women’s area, looked around, saw me in there, and turned his children loose. The children began to run around the room shrieking and yelling, and I was nearly knocked down when one of the little darlings ran into me at full speed.